How can AMS aid in Optometry Billing? Does your practice suffer from these problems? · Is your staff unsure when it comes to billing optometry medical claims? · Does your current billing company not understand Optometry billing and all of its specifics? · Is your Accounts Receivable out of control? · Are you losing money on claims that are not collected? · Are you not taking advantage of Meaningful Use and PQRS? These complaints are not uncommon. We come across these things, and worse, from optometrists and office managers all the time. Believe us when we say that you are not alone in these concerns. The good news is we can help you have power over your optometry billing. We can help you get back on track. Our staff knows how to process claims properly so you don’t have to. 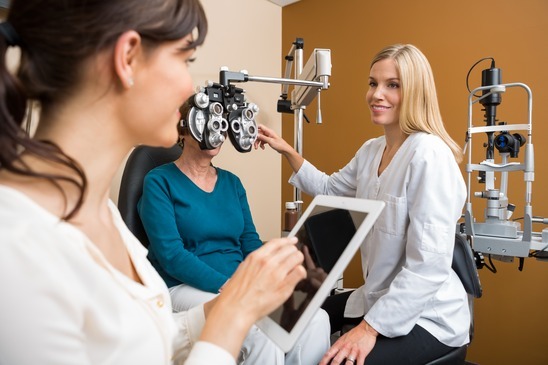 You can have confidence in our optometry billing because we have years of experience. We can get your A/R under control and stop you from losing money. Most providers seem to pay a lot more in billing staff/front desk staff than they should because nothing is automated. Taking the time to scrub the claim on the front end, prior to submittal is the key to success, rather than copious amounts of auditing after the denial has taken place. Applied Medical Systems thrives in this area with our front end rules system called RealClean. For example, RealClean targets certain combinations of diagnosis and procedure codes and payers, and stops the claim to request a chart audit if we think a refraction or fundus photos may have been performed and not coded. Have Billing Questions? Check out our Optometry Billing FAQs page. Head over to our Optometry Coding page to see how our coding experts can help your practice thrive.